BELLEVILLE – Military families moving to Ontario will soon have a hotline available to them to find services and help with the transition to their new homes. The Ontario government will create a hotline for military personnel to use as a “one-stop-shop” to get everything from a driver’s licence and health card to childcare. Premier Doug Ford delivered the announcement Wednesday morning with Bay of Quinte’s MPP and Minister of Economic Development, Job Creation and Trade Todd Smith and Minister of Government and Consumer Services Bill Walker at a press conference held at Trenton’s National Airforce Museum of Canada. 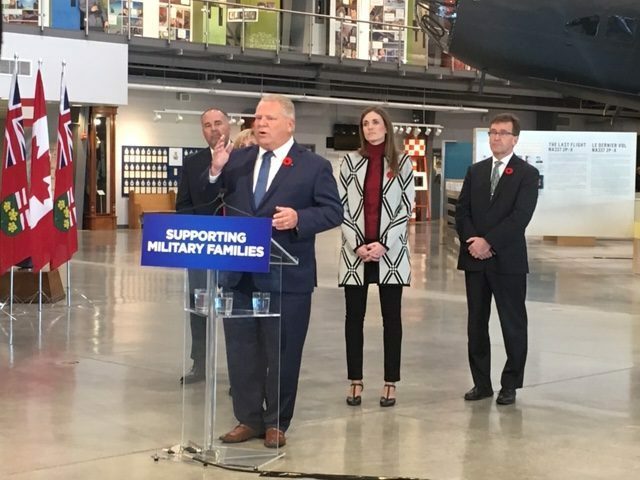 Military families are transferred across the country three times more often than the average Canadian in their career, Ford said. “These moves cause stress and anxiety, and our government wants to do all we can to make life a little bit easier for military family members,” he said. A consultation process with military families, stakeholders, and other jurisdictions will take place over the next 3 months to understand what services and programs are in demand to create a seamless transition into the province, said Walker. An information portal is currently available to find services and programs, and in-person consultation sessions will be available at a later date. The creation of a military caucus at Queen’s Park was also announced by Smith. It’s purpose according to a news release is to find a solution to family members being left behind. “I’m looking forward to ensuring that children who need mental health counselling and other medical specialists appointments aren’t falling to the bottom of the waiting list because their Mom or Dad gets transferred to CFB Trenton, Borden, Petawawa and other locations in Ontario.” he said in a news release. Tamara Kleinschmidt, executive director of Trenton’s Military Family Resource Centre, said it was a very welcome announcement. 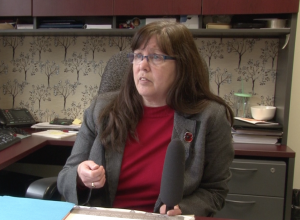 She says the consultation lasting 3 months demonstrates how committed the government is to making sure services meet military families’ needs, especially because Ontario is the province where the most military families live. “It’s thrilling to see the government actually putting into action something to make a difference,” she said. However, talk of the hotline at the news conference was cut short by questions from reporters about the resignation of former Ontario cabinet minister Jim Wilson due to sexual misconduct allegations. Speaking for the first time since the resignation, Ford said Wilson’s accusers asked that the media not be alerted about the allegations. Ford clarified that an investigation is ongoing and Wilson was forced to resign as a result. Protecting people takes priority over the media, he said. “I have zero tolerance for this behaviour,” he told reporters. – Lori-Anne Little and Samantha Rice contributed reporting.